* eBooks available through Kindle Books. Click here to see details, images, and sample PDF book pages. 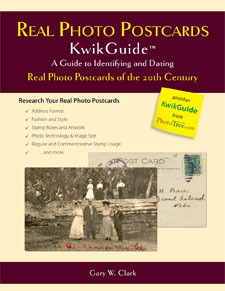 A Guide to Identifying and Dating Vintage Photos from 1900 to 1950. Do you have a collection of unidentified photographs? 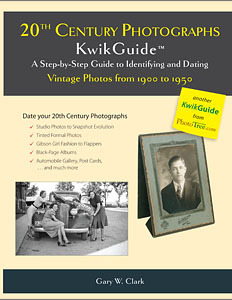 The 20th Century Photographs KwikGuide is the fifth book in a series that helps genealogists and family historians date old photos and identify the people in them. Covering photographs from 1900 through World War II, each decade is studied to reveal clues that place photos in their correct historical timeline. 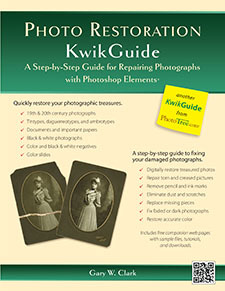 Everyone has photos from the 20th century; this is must-have for any genealogist's or family historian's library. 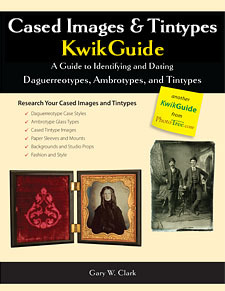 A Guide to Identifying and Dating Daguerreotypes, Ambrotypes, and Tintypes. Click here to see more details and images. A Step-by-Step Guide to Identifying and Dating Cartes de Visite and Cabinet Cards. 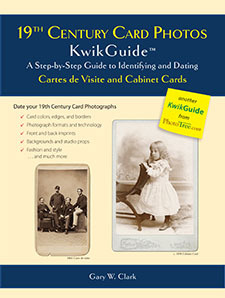 19th Century Card Photos KwikGuide presents a fun, interesting and easy-to-follow set of clues that guides genealogists, historians, and other researchers through the task of dating their card photographs from the 1800s. With over 200 high quality documented photographs included as examples for every clue, the researcher can accurately and with confidence determine most photograph dates within two to six years. Digitize and Protect You Vintage Film. Vintage negatives and slides are the most overlooked, if not ignored treasures in family archives. However they can be a great source of information and joy. Yet, there are some safety considerations to be aware of with old negatives. Available in Kindle books August 5th. * May be discounted by Amazon. How to photograph oversize photos, curled documents, and heirloom treasures. 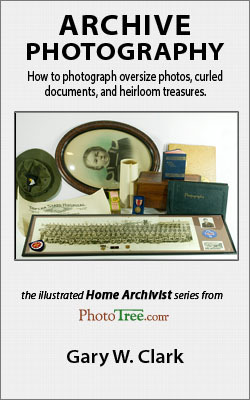 Photograph your large pictures, documents, and heirloom items to secure their history for future generations. Too big for a scanner? Archive Photography will shows you how to create great pictures of just about everything you want to archive. Photograph Gravestones and Document the Grave and Cemetery. 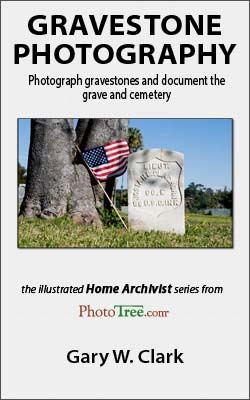 A Kindle book on photographing gravestones and documenting the cemetery. Overcome poorly lit gravestones, best time of day to photograph, use Google Earth and GPS coordinates, learn about online services such as Find a Grave and Billion Graves. Cruel Irony - Triumphs and Tragedies of a Modern Woman is the story of a family coming to Canada in 1855, following new opportunities to the U.S. in 1870, and settling on the Kansas prairies. And that was the easy part. 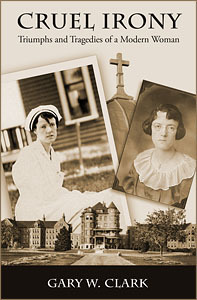 The heroine, Esther E. Johnson, overcame setback after setback, explored post- World War I freedoms, and became a respected nurse. Her life was cut short in the most surprising manner possible. A cruel irony indeed. Intrigued by entries from my mother's 1945 diary, I began to research her aunt, Esther Johnson, whose story was only in family lore, yet appeared to be a dramatic account of the times - and unfortunately many family conflicts. Released in 2015, Cruel Irony is available in print and Kindle ebook. FUBAR 2.0 – A Soldier's Insight into Military Chaos, released in 2014. It is an honest and humbling visit to the military's absurd side. Though, along with the humorous accounts are some sad stories, and some that are shocking. FUABR experiences are a part of a serviceman's or woman's life. FUBAR even shapes their character. Understanding how these events happen will help understand the soldier, sailor, marine, and airman. The book chronicles two years of FUBARs that snake through induction, basic and infantry training, nuclear warhead security, deployment to Germany, and the last leg of my world tour, Vietnam. 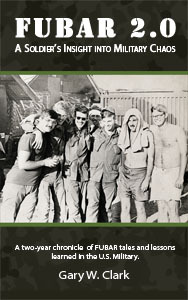 The book is entertaining and funny, much at my expense, yet it unveils many military absurdities, some shocking; and open a window to the experiences of veterans you know, past and present; hopefully illuminating and appreciating the situations they encountered. Understanding the absurdities they fought and embraced can explain a lot about what shaped their character.